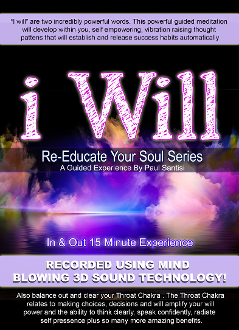 This is a quick and very effective 15 minute deep relaxed version guided meditation with 1000’s of “ I Will” affirmations in MIND BLOWING 3D sound. "I Will" are two incredibly powerful words. This powerful meditation will develop within you, self empowering, vibration raising thought patternsthat will establish and release success habits automatically. Also the music used will balance out and clear your throat chakra. The throat chakra relates to making choices, decisions, and will amplify your will power and the ability to think clearly, speak confidentl, radiate self pressence plus so many more amazing benefits.